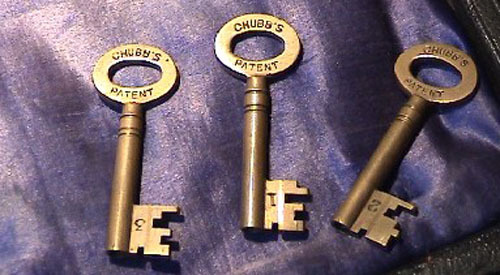 The enigma lock … made by Chubb! it is the star in many war movies and a classic in cryptography. it is quite ironical the German device was locked with a UK chubb lock. new key can open the lock. Simple and elegant. A pure brilliant design. Look at the video clip to see a cutaway model of the lock in action. > submarine by the UK military. ** Update 04/08 we finally had our hands on a real enigma and opened the lock! This entry was posted on Monday, January 22nd, 2007 at 23:23 and is filed under Uncategorized. You can follow any responses to this entry through the RSS 2.0 feed. You can leave a response, or trackback from your own site. Wow amazing lock, just wondering who’s lock is it yours someone elses? Novicelockpicker: The lock belongs to Oliver Diederichsen. It is also his voice you hear explaining about the lock. A few more clips are coming up shot at his place…. I’ve been to Bletchley Park a couple of times (geek heaven), watching the marvels of enigma, colossus and the bombe. I guess Iâ€™m not addicted to locks enough to pay attention to those detailâ€™s. army-version had the 1 out of 5 code-wheels, on the marine-enigma (ENIGMA-M3) you have to choose 3 of 8 wheels. So the machines are not compatible. And as you can imagine now, there is not the one lock used at all enigmas. The most common Enigma-Version used by the germans in the WWII did’n even have a lock (aktually I have never seen an Enigma with a Lock). They had a little clip on the top. I don’t know which Enigma had the lock Olli shows in this video, but I will try to figure it out. Maybe the NEMA (Neue Maschiene, engl. New Machine, a newer Version of the Enigma used by the swiss army) had this Lock. whenever I’ve seen one of these machines on telly or in a picture it always seems to be an ex-field unit in a pretty rubbishy looking box with a simple catch – perhaps the fancy lock was on a display example or maybe a machine made to be presented to a german officer? very interesting lock though, thanks. Do you know if the fences are spring driven, directly engaged by the key, or something else? Do you think a pin and cam would work to decode? TOWCH: I think a pin and cam will open about anything. So this 97 year old lock probably will not have much resistance against it. And I just updated the item. 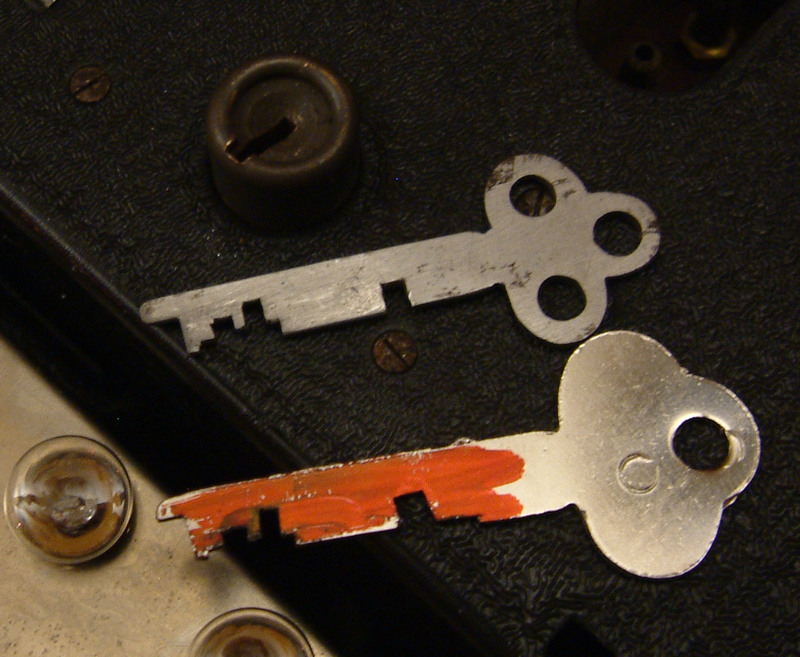 It seems the lock was used to store confiscated enigma material by the UK forces. After reading some websites an some pages of some books I can confirm that no enigma ever had a lock more secure than the ones build into furnitures. No UK locks in german enigmas! That the UK military used UK high security locks to secure very sensible spoils of war however makes sense to me. So lets call this solved. Hey Barry, are you, or Han Fey going to have any firther information about this lock? Soecificly how the mechanism for setting the key pattern in the lock happens. Im facinated at how this works, and am curious as to its inner workings. I will make detailled pictures of the lock when I find the time. Sorry again for our misunderstanding, but it pushed a nice conversation about the enigma machine and we all learned a bit about it. Here’s a much more complex changeable lock. Have you ever seen a Rielda cylinder? These are a changeable lock made in all the standard cylinder types. Entries (RSS) and Comments (RSS). 58 queries. 0.330 seconds.